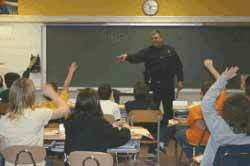 Officer Steven Havens of the Oneonta (NY) Police Department teaching students the D.A.R.E. program. Proponents say that D.A.R.E. has helped prevent drug use in elementary, middle, and high school students. They contend that D.A.R.E. improves social interaction between police officers, students, and schools, is the most prevalent substance abuse prevention program in the United States, and is popular with kids and parents. Opponents say that dozens of peer-reviewed studies conclude the D.A.R.E. program is ineffective at preventing kids from using drugs. They contend that D.A.R.E. causes kids to ignore legitimate information about the relative harms of drugs, and that D.A.R.E. is even associated with increased drug use. D.A.R.E., an international 501(c)3 nonprofit organization, is the most prevalent drug abuse prevention program in the United States, and is often referred to as the most prevalent drug prevention program in the world. The original D.A.R.E. program was developed in 1983 as part of a joint effort between the Los Angeles Police Department (LAPD) and Los Angeles Unified School District (LAUSD) to "to break the generational cycle of drug abuse, related criminal activity, and arrest." The original curriculum consisted of core elements such as resistance, skill training, and self-esteem building, supplemented with additional information on gangs and legal issues related to drug use. The program focused primarily on what it calls "gateway" drugs, such as tobacco, alcohol, marijuana, and inhalants, which allegedly lead to harder drug use. Studies about the Efficacy of D.A.R.E. Anti-D.A.R.E. 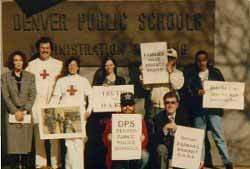 protest at the Denver Public Schools Administration building. Do Violent Video Games Contribute to Youth Violence?